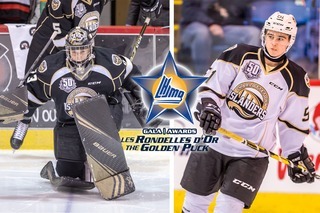 SHAWINIGAN, Quebec – The Chicoutimi Sagueneens made the most of their two strategically placed first round picks on Saturday at the 2018 QMJHL Draft, selecting this year’s top prospect with the first overall pick and went across the Atlantic with their seventh pick, selecting a forward many saw as the best available player. 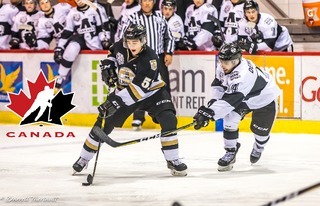 Four Maritimes-based players were also called on stage at Shawinigan’s Centre Gervais Auto during this first round, including defenders Lukas Cormier from the Moncton Flyers, a fourth pick by the Charlottetown Islanders. Here’s a look at the players selected during the opening round of the 2018 QMJHL Draft. Unsurprisingly, the Chicoutimi Sagueneens used the first overall pick to select this year’s top prospect, centreman Hendrix Lapierre of the Gatineau Intrepids (Quebec MAAAHL). The forward scored 57 points (17-40-57) in only 35 games. He was considered as this year’s top draft prospect. The Saint John Sea Dogs then turned to Magog Cantonniers (Quebec MAAHL) defender William Villeneuve. The 6’1’’ and 154 lb blueliner is an offensive threat and he picked up 15 points in 18 playoffs games this spring, contributing to his team’s Jimmy Ferrari Cup conquest. 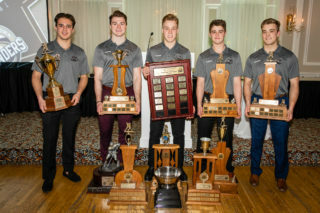 Ranked fifth on the CSR list, Bourque was snatched earlier by the Draft’s host, to the great pleasure of the few thousands at Centre Gervais Auto. The Cats had no intention of letting the local product go by. The Trois-Rivieres Estacades (Quebec MAAHL) star is the complete package with 46 points in 40 games this season and hard to face in one-one-one situations. The small player is also known for winning his battles along the board. 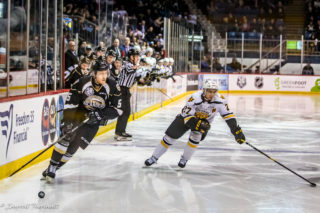 The Charlottetown Islanders created a double surprise with the fourth pick since many expected them to trade their pick. Instead they showed up at the podium and claimed the first player out of the Maritimes, defender Lukas Cormier of the Moncton Flyers. The other surprise was that the defender was only ranked 10th on the CSR list, but the Islanders fell for his explosive skating and offensive abilities that reminds of a certain Samuel Girard who recently made the jump to the NHL. The early departure of Bourque and Cormier possibly rejoiced the Sherbrooke Phoenix who was next in line with the fifth pick. The Eastern Township side turned to local talent Patrick Guay, brother of Drummondville Voltigeurs’ captain Nicolas Guay, who grew up and still lives in Sherbrooke. The 5’8’’ and 154 lb forward scored 34 goals and 64 points in only 39 games last season with the Magon Cantonniers. The Rouyn-Noranda Huskies selected right winger William Dufour of the Seminaire St. Francois Bilzzard. At 6’1’’ and 170 lb, the young man has all the tools necessary to succeed and live up to the expectation and become a leading power forward in the Q. One of the storylines of this opening round was to find out who would gamble on a forward who was considered by many pro scouts as being the best player of the class of 2018. Speaking seventh, the Chicoutimi Sagueneens used the opportunity to select centreman Theo Rochette, a protégé of agent Pat Brisson who picked up 34 points in 38 games while playing with much older opponents and team mates. With their second pick of the opening round, the Sea Dogs once again selected a defenceman, this time turning to Jérémie Poirier of the Chateauguay Grenadiers. The young man just completed a phenomenal season with 31 points in 40 games. He is known for his hockey sense and great skating skills. Look for him to become a fan favourite at Harbour Station. 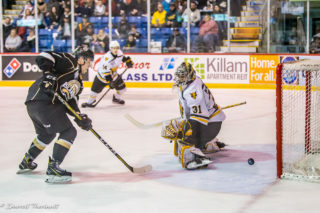 Roy has speed, hockey sense and the skills to become an offensive threat in the Q. Scouts say that Roy is a constant danger in the offensive zone, which promises to make many happy at the Robert Guertin Arena. Drover somehow defied the odds after being ranked 20th on the CSR list. He will have the opportunity to play close to home since his new uniform is that of the team he grew up supporting during his youth in Nova Scotia.